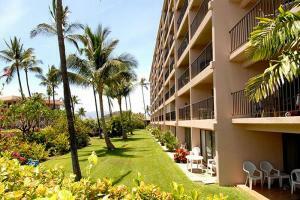 The Kihei Akahi is situated on Maui's southeastern coast in south Kihei, across the street from Kamaole Beach Park II. Every unit includes a lanai, washer and dryer, ceiling fan, and full kitchen. Guests can enjoy an array of amenities including landscaped grounds, two pools, a tennis court, barbecue facilities, a covered recreation facility, and complimentary parking. Shops and restaurants nearby. Kahului Airport (OGG): Approximate driving time is 25 minutes and distance is 12 miles. Shopping and Restaurants: Many fine restaurants and shops are just a short walk away. Maui Oceanarium, Golf, Volcano Trips, Helicopter Tours, Hana Adventures, Sailing Trips, Wailea's Finest Luau, Hike Maui, Golf, Snorkeling, Scuba.